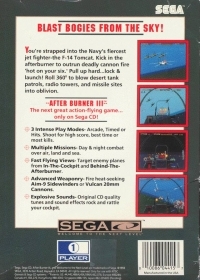 Box Text: You're strapped into the Navy's fiercest jet fighter-the F-14 Tomcat. Kick in the afterburner to outrun deadly cannon fire 'hot on your six.' Pull up hard...lock & launch! Roll 360 degrees to blow desert tank patrols, radio towers, and missile sites into oblivion. 10-26-2012 exonerator Box Text You're strapped into the Navy's fiercest jet fighter-the F-14 Tomcat. Kick in the afterburner to outrun deadly cannon fire 'hot on your six.' Pull up hard...lock & launch! Roll 360 degrees to blow desert tank patrols, radio towers, and missile sites into oblivion. This is a list of VGCollect users who have After Burner III in their Collection. This is a list of VGCollect users who have After Burner III in their Sell List. 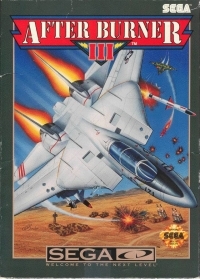 This is a list of VGCollect users who have After Burner III in their Wish List.